Jamaica, the island of Bob Marley and where everyting is irie mon. But everything wasn’t always alright in the third largest of the Caribbean Islands. As a colonial outpost, Jamaica saw its fair share of strife and violence – 16th century skirmishes between the Spanish and Native Arawaks, battles with pirates and conflict between the Spanish rulers and the British, who finally ousted them in 1655. Jamaica was also the base from which the notorious privateer Captain Morgan operated. Then there were bloody slave revolts in the early 19th century. But today Jamaica is one of the top tourist destinations in all of the Caribbean and the world. While Jamaica today is almost synonymous with its Reggae music, friendly people and tasty Jamaican “jerk” dishes, it is thriving as a vacation destination with its beachfront luxury hotels, its many all-inclusive packages and its beautiful mountain retreats. It also happens to be one of the best locations in the Caribbean for sport fishing. It has a large network of fishing charters and guides and a distinct advantage as an English-speaking nation. 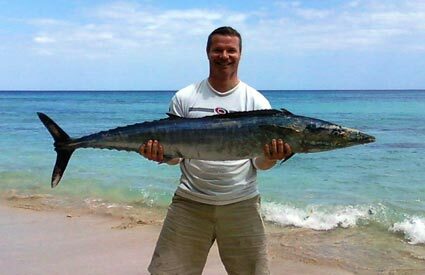 Jamaica Fishing Charters are an excellent way to experience all that its waters have to offer. Jamaica has large populations of Marlin, Mahi-Mahi and Sailfish and its deep-sea Fishing Charters will take you directly to the most popular areas where you can get your bite on. Fishing Guides focus more on shallow water and reef-fishing in the area and will put their expertise to use as they help you find jack crevalle, yellowtail snapper, grouper and mutton snapper amongst others. No matter what type of fishing excursion you are after, hiring a Jamaican Fishing Guide or booking a deep-sea charter boat will ensure you have the best opportunity to catch your share of fish in this beautiful island nation. You will find complete fishing charters in Montego Bay, Negril, Ocho Rios and in many of the other top vacation locations on the island. When you make Jamaica your fishing destination, you just know everyting is gonna be irie! Jamaica is an island nation of the Greater Antilles, 145 mi in length and as much as 50 mi in width, and amounts to 4,243 sq mi. It is situated in the Caribbean Sea, about 90 mi south of Cuba, and 119 mi west of Hispaniola, the island harboring the nation-states Haiti and the Dominican Republic. Its indigenous Arawakan-speaking Taíno inhabitants named the island Xaymaca, meaning the “Land of Wood and Water”, or the “Land of Springs”. With 2.8 million people, it is the third most populous anglophone country in the Americas, after the United States and Canada.